Focaccia is a delicious herb-infused bread with olive oil and lots of spices. The flavors are robust and many versions have been adapted through the years. I made this dough stuffed with Italian cheeses. It's baked to perfection and the aroma is fabulous while baking, it's hard to wait until it's done baking to eat it! Comfort food comes in all forms, for me, it's homemade bread of any kind. This dough is so versatile it can be transformed into pizza, fried for a savory flavor or just the way it is! Flat Bread or Stuffed Pizza Dough? Focaccia is a flat oven-baked Italian bread product similar in style and texture to pizza dough. This change and style was always a favorite. 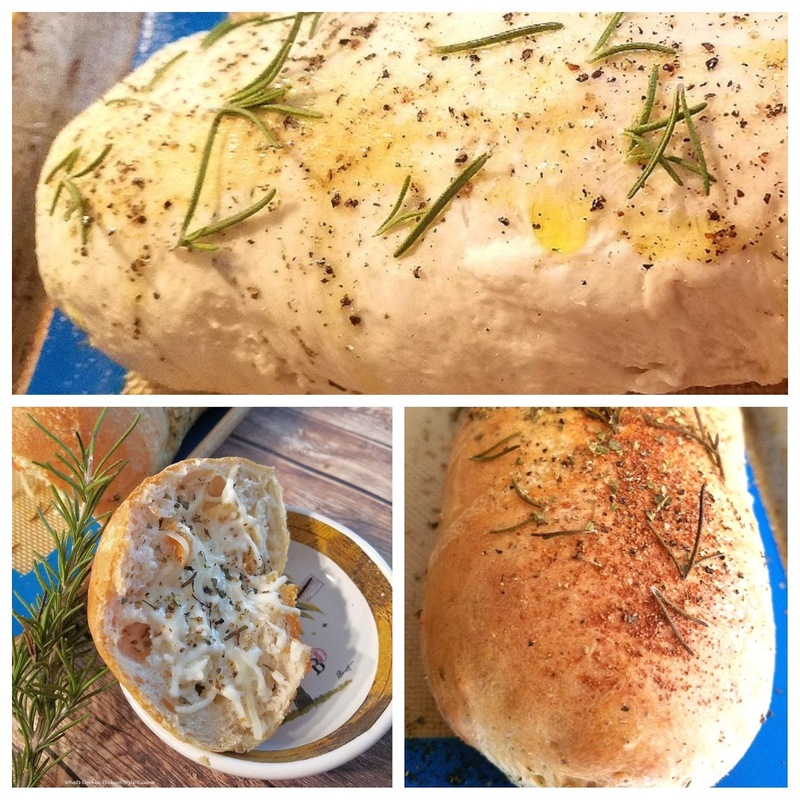 Focaccia with fresh rosemary on top is a common focaccia style in Italian cuisine that may be served as an antipasto, appetizer, table bread, or snack. Many Styles to Make Focaccia? Focaccia (pronounced "fuh-KA-cha") is a flat oven-baked Italian bread product similar in style and texture to pizza doughs. This dough can be used for any style of stuffed bread, pizza dough starter and a common style of table bread. The smell is fragrant and using fresh herbs makes this unique flavor. The classic style is a flat pizza with spices, herbs and baked to a crispy crust till golden brown. Delicious as an appetizer with some wine. Today's post is a tribute to my mom's birthday January 8th, 1919 she passed in June 1999. Until we meet again, she lives on in the kitchen. Growing up in an all Italian household, mom regularly made focaccia bread from a Southern Italy, style, she was from Bari. Every Region makes it a little different. I believe it was started in Northern Italy. Well no matter which way you make this delicious dough, it's a treat. The whole family will enjoy it and you can add whatever you like on it to please them. The combinations are really endless. If you do look up the original style from Italy, the recipe is plain and simple. It really use to be a traditionally served on Christmas Eve for centuries. I see it as a flatbread kind of pizza. There again are so many versions depending on the Region of Italy it was made. January 8th was mom's birthday and I decided this was going to be made in her memory today. I did, however, do this completely different! I stuffed it with cheeses and baked it like a roll. The bread is the same with an Italian stuffed cheesy filling. It's wonderful, light and the perfect focaccia bread. She lives on in all her recipes. 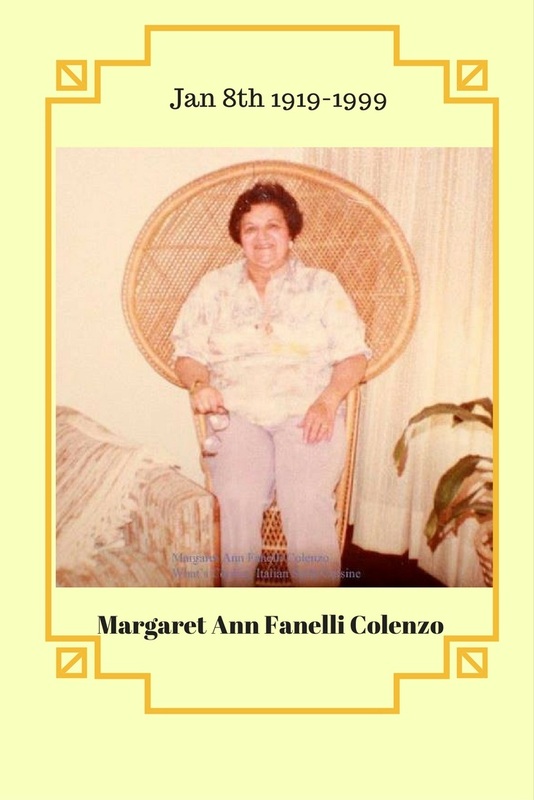 Happy Birthday Margaret Ann Fanelli Colenzo! Always in my heart. Through the years of mom's passing, I find it heartwarming and yet still difficult without her by my side showing me her way to prepare foods. I love to keep her memory alive by making her foods. That's why I made the cookbook in her memory. Nothing could replace those days, I miss her every day that goes by. We were very close as mother and daughter could be. Mom had me very late in life at age 40. She passed away at 80 years old. I don't think anyone is ready to lose their parents. The ache never goes away. One thing for sure, she never measured a thing when cooking, it's been quite a challenge recreating her recipes. Mom was a good teacher, and since I loved to cook, I watched intently in the kitchen and so grateful. If you would like to make regular focaccia, just stretch the dough out and use the toppings plus bits of tomato and minced onion with your herbs and even sliced olives. Let the dough rise till double in size. This dough is versatile. You can use it for all your pizza needs, it's easy and basic. If you would like to add tomato inside, it tends to stay wet and gets soggy. The toppings are an enhancement of a thicker bread, unlike pizza which is thinner. Mom made so many rolls stuffed like sausage and pepperoni. 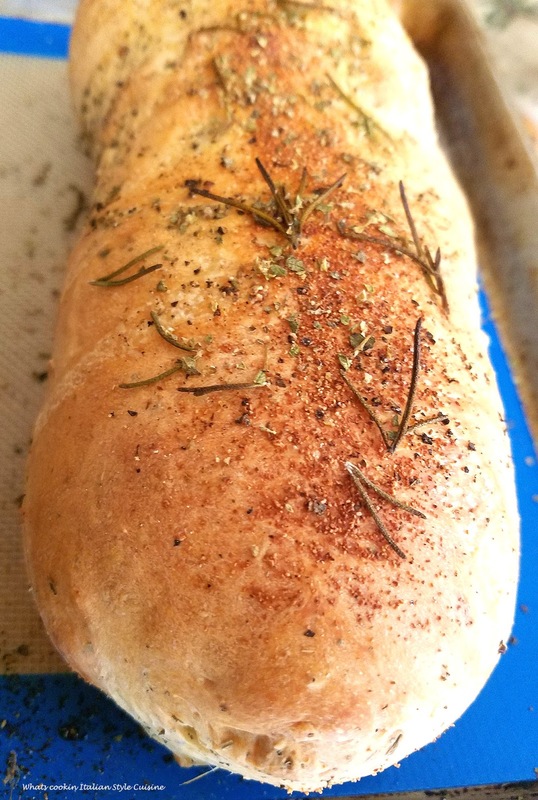 The focaccia dough adds loads of flavor to the rolls. Regular style focaccia my mother made was thicker than pizza, dimpled, drizzled with olive oil, and topped simply with a bit of tomato, onions, and herbs. It was delicious and love this dough either way you make it. There are so many toppings through the years people have added. Besides fresh rosemary, add sliced olives, onions, peppers, anchovies. You can come up with many ideas. Blend all the dough ingredients until this forms a soft dough using either an electric mixer, bread dough machine or by hand. 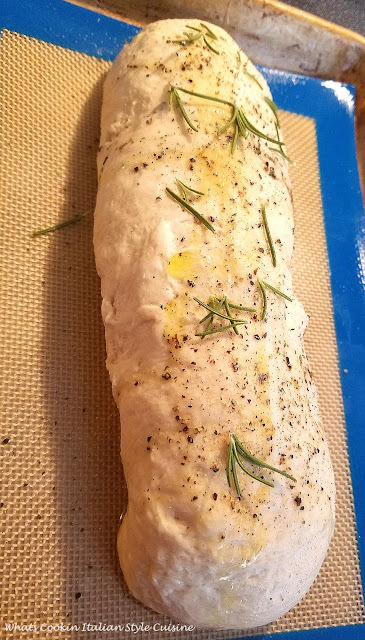 Let rest and rise for 1 and 1/2 hours. Roll out the dough. spread with filling. Roll up like a jelly roll, seam side down. Brush with more olive oil, sprinkle generously with grated cheese. Sprinkle top with chopped fresh rosemary, basil, and freshly cracked black pepper and dried oregano. Bake for 45 minutes or until golden brown at 425 degrees preheated oven. wow that looks so good with that crunchy crust! This cheesy bread looks wonderful!!! Stuffing the focaccia with cheese sounds like a great idea. I made this yesterday and it didn't even get the chance to cool off! We are definitely a homemade bread family and my grandchildren loved it. My mom was always in the kitchen and her food was legendary. Both of my parents died a few years ago and I still miss them so much. I really was unprepared for the fact that the grieving never stops. I can feel her with me when I am in the kitchen making her recipes. Thanks for this wonderful focaccia. Thank you for sharing your stories about your mom to us. Please continue to share her recipes and stories. This bread must feel extra special to you as you bake it. I love Italian food and can't wait to try this recipe! What a great looking focaccia and I love the "surprise" with the cheese inside. Family recipes are the best, keeping our loved ones who've moved on dear in our hearts and lives. I love that you included a picture of your mom here, too. <3 Thanks for sharing this special recipe. Ok the only thing better than focaccia is CHEESE stuffed focaccia!! YUM!! 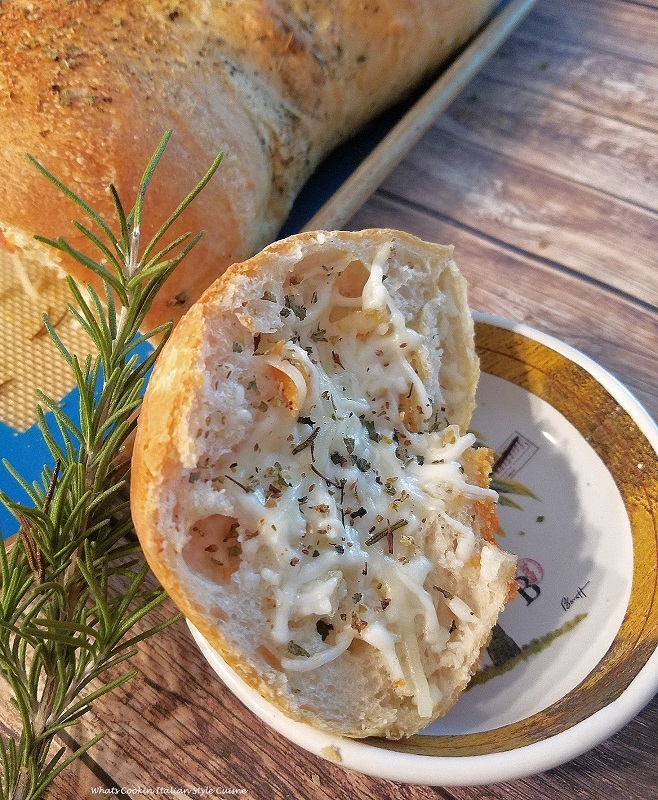 Cheese + Bread - can't go wrong with either of those! Looks delish! This looks incredible!! It won't last.. it probably won't even get a chance to cool! 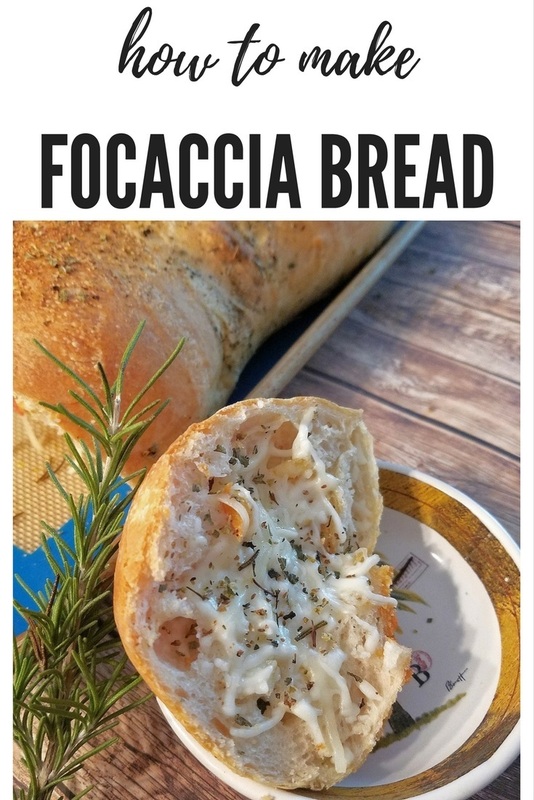 That focaccia bread looks and sounds terrific. I love the smell, taste and texture of freshly baked bread, this made my mouth water a bit. Wow, this bread looks incredible! That cheese!! A lovely tribute to your mom to create the cookbook in her memory. Thank you for sharing! I am a HUGE bread and cheese lover (add some wine too). This is right up my alley. I love the armoma of fresh baked bread. I can just imagine how delicious this tastes! You are right, no one is ever prepared to loose a parent, no matter how old you are. I love bread and cheese and this one looks perfect. Love the melted cheese on the bread. My favorite is focaccia. What a nice tribute to your mom! I'm a little surprised by your use of focaccia bread for stuffing. I would never think of that. But guess what I'm doing the next time I make focaccia?! There is not much better than a good homemade bread. I have never tried making focaccia bread, but it is definitely on my to-do list! Your reason for starting the blog is a lot like my reason. The kitchen was where we gathered and talked, shared our hopes and dreams and cooked. Lots of cooking. I had my mamma for 65 years -- it wasn't enough!! She wanted to go be be with my papa -- the love of her life. I can't talk about them without getting teary-eyed. Your mamma's bread looks wonderful I love the addition of cheese to it. It would be something our family would enjoy. Cheese and bread my two favorites, this looks and sounds delicious. I'm sorry to hear about your mother. I agree that the ache never goes away. I'm glad you have this recipe to remember her by, I always turn to my mother's recipes whenever I'm missing her too. What a lovely story and beautiful memory of your mother. I'm so sorry to hear she passed away. Bread looks absolutely fantastic. I'm such a huge fan of flavored breads like this one. Just delicious! What a beautiful tribute to your Mom! This bread looks absolutely amazing, there is just something special about fresh baked bread fresh out of the oven. I am seeing these cheese stuffed focaccia for the first time. This is really great recipe because it came from your mom. Moms makes best food. I miss my mom too. Yes nothing can beat mom's cooking. I like your Focaccia Cheese stuffed bread. Great with a bowl of soup. Every time when we make dishes the memories bring closer to them. What a lovely tribute to your mom. The pain of losing a parent is always there - it never really goes away. Mom's focaccia looks amazing. Love your cheesy version - I think my family will enjoy it. This bread looks incredible, and what a special link to your mother. Those recipes given to us by those we love are always the best. What a great idea and very creative. We make focaccia all the time but we don't stuff it. But, how can you go wrong. We love cheese and we love bread. Putting the two together is a wonderful combination. I'm going to have to try this out. We are busy baking bread for the holidays but I'll make time to make this. Hope all is going well with you!! You said focaccia? OMG! I adore focaccia! And also does my Whole family! I should make this!